Have you lifted your truck 10" or more and can no longer use your front driveshaft?! This indexing ring will allow you to rotate your transfer case downward and get your front driveline angles back within spec for your factory driveshaft. CNC machined from solid 1" thick 6061-T6 aluminum, this spacer will re-index the transfer case. It is designed with three adjustment holes which allows for 15, 20, or 25 degrees of clocking to your transfer case. 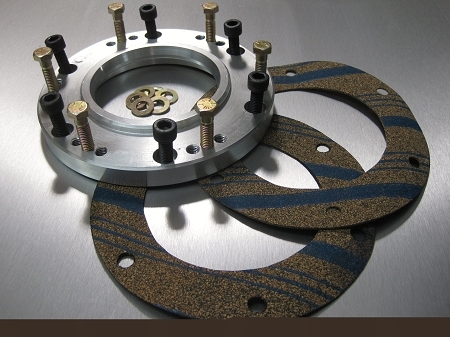 All hardware and gaskets are included. Special Notes: Will only work on trucks equipped with a NP 273 or 271 transfer case, please check ID tag to verify!! This will push the transfer case to the rear of the truck 3/4", please keep this in mind concerning driveshafts, manual 4x4 linkages, etc. 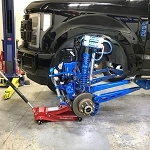 Also your factory crossmember will need to be heavily modified to allow for the new location of the transfer case and driveshaft or you can purchase one of our matching HD crossmembers for a headache free installation! Please note that our crossmember by not work with some aftermarket 4-link setups depending on how they mount to the frame, please check with one of our sales reps to ensure it will install properly if you have doubts.